Getting your villagers to a point where they are self-sufficient is just one part of Virtual Villagers. There are a total of 16 puzzles that need to be solved to complete the game. Some of the Virtual Villagers puzzles make life easier for villagers and others just make the island look pretty. 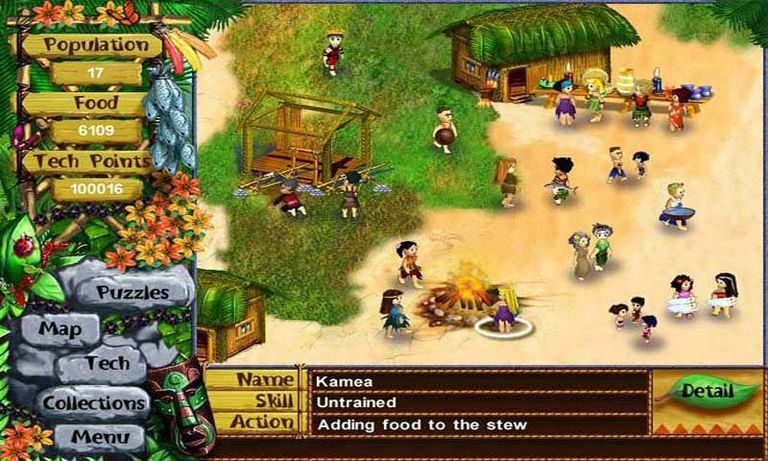 Use these tips to solve the puzzles in Virtual Villagers, but remember that some of them need to be completed in order for other puzzles to work properly. Puzzle 1: The Well: Have a builder remove the water supply's well cover by dragging him to the well. Puzzle 2: The Hut: Build a new hut for villagers to live in. A villager who is trained to build is required. Puzzle 3: The Beach. Clean up the debris on the beach so the villagers can hunt for fish. Just drag the villager over there to have him start cleaning. Puzzle 4: The School: Convert a building to a school by dragging a master scientist over to the building. Puzzle 5: The Lagoon: Have a builder remove the blockage from the creek. The villager needs Level 2 of Construction in order for this to work. Drag the villager to the rock pile that's blocking the water; the water then will flow to the lagoon. Puzzle 6: The Magic Fish of Fertility: After completing Puzzle 5 and having a Level 3 harvester, take the master farmer fishing at the lagoon. Puzzle 8: Natural Mastery: Discover herbs by researching 4 specific plants on the island. One is the cactus near the boulder, another is near the lagoon, and two are on the east side of the island. Drag a villager to each plant until each is mastered. Puzzle 9: The Garden: So long as Puzzle 5 is completed, put a builder villager where they see dead flowers on the east side of the island. They will need to bring water from the lagoon to revive the garden. Puzzle 10: The Magic Plant of Life: Do Puzzle 14 first and then wait for the butterflies to follow the Golden Child. Then, drag the Golden Child to the plant north of the berry bush so that the butterflies can pollinate it. Puzzle 11: The Temple: Restore the temple at the ruins by dragging a villager to the ruins in the southeast side of the island. This requires Level 3 Construction. Puzzle 12: The Idol: Reach Level 3 of Spirituality and be sure to finish Puzzle 11. Then, drag a builder over to the rock near the lagoon, on the west side, to have it chisel an idol out of the rock for the temple. Puzzle 13: The Golden Child: With Puzzle 5 and 12 completed, and Level 3 of Fertility, put a nursing mother in the lagoon. The child will become The Golden Child. Puzzle 14: The Butterflies: As long as the previous puzzle is finished, put The Golden Child on the magic garden discovered in Puzzle 9. Butterflies will appear and follow The Golden Child. Puzzle 15: The Treasure: Discover buried treasure located south of the food bin, between the bin and the temple. A clue will not be given by just dragging the villager over the area. You need to place a master builder to find the hiding spot. This puzzle requires Level 3 of Construction and Level 3 of Science. If you need help, see this screenshot of the treasure location in this puzzle. Puzzle 16: The Cave: The Golden Child will remove the boulder blocking the cave, but only when it's ready to move it; you can't force it.